Designer Thomas Jayne is known for creating rooms that reflect a strong connection to history and place. He has written a number of books on architecture and design. His background includes fellowships at the Metropolitan Museum of Art American Wing, Historic Deerfield and the J. Paul Getty Museum. And he pursued his interest in architecture and decorative arts at Christie's estates and appraisal department. He worked at both Parish-Hadley and Kevin McNamara and opened Jayne Design Studio in 1990. And although he loves antiques, he wants things to look fresh, using inspiration from the past to come up with beautiful livable rooms. Good morning all. And it's a sunny morning in DC so all is good. I love talking about traditional decorating and design and antiques and Thomas Jayne is the perfect person to do that with. 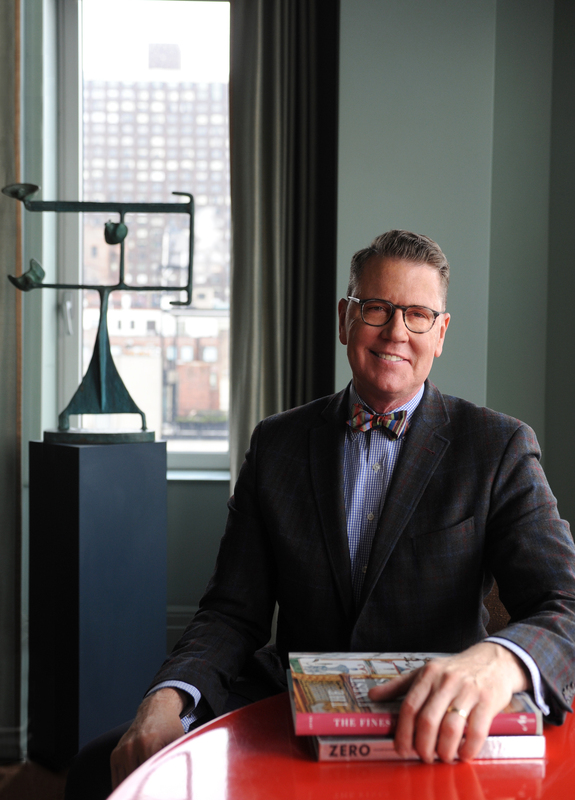 Thomas founded the Thomas Jayne design studio in 1990 and his passion is designing rooms that have a strong connection to history and place. He has worked at many amazing institutions including the American Wing of the Metropolitan Museum of Art and the J. Paul Getty Museum, as well as Christie's. Before he opened his own studio he had worked with the legendary Parish-Hadley & Associates and Kevin McNamara. A great chance to ask your questions so let's go. Hi there, Thomas Jayne of Jayne Design Studio here to answer all of your design queries. Traditional can new a bit of a taboo word these days, but hopefully I can convince you that it doesn't have to be dull. Skeptics welcome! Thanks for having me. My furniture is traditional in style. I like the style but it’s looking fussy and fuddy duddy to me. Although I am a grandmother I don’t want my home to look like it’s a time capsule of another era. I’ve been doing some research and I think if I update the upholstery both in fabric and in how the pieces are reupholstered (cleaner lines, no buttons in the cushions, simpler skirting) that will help a great deal. Do you have any suggestions? The knickknacks are going to be scaled WAY back. Thank you. I loved your recent release!!! What do you think you and Edith Wharton have most in common? What is the best neutral paint color for my coastal living room with cathedral ceilings. I have a white slipcovered couch and chair/ottoman and beige carpet over hard wood floors. And light green/turq drapes from PB. I've been searching and searching for full length curtains or drapes in a traditional, floral pattern that don't cost of fortune, but also don't look cheap. What are your favorite sources for window treatments? I have not seen any nice curtains in printed designs that are decent to my eye. One is really forced to add patterns to a room with carpets and pillows. Art is aways an important addition. and/or budget for custom curtains. I was so excited when I saw this topic because I think about it a lot. What can I do to make it look at least a bit more current? I'd love my house to look more like Crate and Barrel or Pottery Barn without getting rid of all my furniture. Change the lighting? Change the coffee table and drapes? Or get rid of the drapes altogether. What books would help perhaps? Also, where is a friendly online place that would cater to us baby boomers looking to update our abodes. I hope you will step back and think about why you love traditional design--for its personality, charm and quality. These are not qualities one finds at Crate and Barrel of Pottery Barn. So don't give into their massive advertising if not brain washing...You can make your rooms look fresh by introducing a new palette and perhaps some 21st century accessories. Look at the antiquaries on instagram for company. There lovers of "brown furniture" abound. When you start working on a room, I imagine you have a very well choreographed process. In which part of that process is color established and what are the factors you consider? Also, what happens if the client insists on a specific color? I thing finding the floor covering is the primary step because there are less variables. Finding the carpet even if it is a simple sisal makes the foundation. And there is no color that one cannot use well--from black to white and all the points on the color wheel--but some colors such as say, lots of purple, is a decorator challenge. I absolutely loved your newest book!!! Do you ever paint furniture? I've never done it and am always so nervous to run the risk. I'm considering painting my living room a light pink color. We've been considering colors that read a little more beige than "princessey pink." The living room is north-facing and gets okay light though we live in a row home. The only catch is, our chimney exposed in the room and the brick is a red/coral color so it can't be too coral of a pink or it might clash. Do you have any favorite light pinks that might work in my space? Pink is a fantastic wall color because it changes with the light and it is supper flattering. You can see a pink room in my New Orleans apartment on Jaynedesignstudio.com Error to pink with more yellow to deny Barbie her true color choice. We are thinking of buying a 1870s Victorian home. The current traditional dining room (good size, high ceilings, one window, black slate fireplace) has white walls and a Cobalt Blue ceiling. The impact of the ceiling color is strong, but it's also rather beautiful. What wall color or wallpaper would you suggest (the white seems too stark)? What is your favorite magazine to source inspiration? Congratulations on your home ownership. And yes, it's a lot of work! Everything you do to maintain the house also maintains your investment. It's tough to get a routine going for all the tasks you need to do spring, summer, fall and winter. But once you get the right people, it goes better. Joining a neighborhood list serve is a good way to get the names of good plumbers, electricians, gutter cleaners etc. who are well connected and charge fair prices. Hopefully, you will make a list of things that needs to be done short term and long term and work through it. You can't have the house of your dreams right away. Good luck and hopefully you will be enjoying your yard as the weather gets better and feeling proud about owning your home. How do you add traditional elements to a home without making the space look old or stuffy? It all has to with arrangement and editing. With collectors I always ask what is beloved and what might be there by accident or chance. I try to keep only what is loved and then arrange it artfully. I do think rooms need something 21st century to make them fresh. If you had to live with one paint color for the rest of your life, what would it be? Thomas, I saw you at Legends last year, talking about building collections. I love small trinkets, but don't know how best to display them all together - best advice? I am looking for a coffee/cocktail table for a medium-sized library. All of today's coffee tables are huge and modern, even the hybrid ottoman styles. What styles work in a traditional space without looking old fashioned? We use a lot of Chinese low tables and old trunks. And some times we spring for a custom coffee table as the one luxury to center the room. Sorta like a good handbag with a more modest ensemble. My brother and his wife recently bought a house in a D.C. neighborhood and discovered there's an occasional rumble from the metro trains passing underground. It doesn't bother their pets but they're worried the vibrations could bother a baby should they have one in the next year or so. Any experience with this? Would soundproofing furniture pieces maybe help them? So many "cheap" Ikea-like designs have confused design, designers and the home-dec market. Collecting has a reputation of "clutter" in design and authenticity gets lost with "the look" that is mass-marketed. Can a "got-milk" or Ikea-miles" work to salvage and freshen the distinctive incorporation of antiques, craftsmanship, and taste? Quality never disappoints: most retail furniture self destructs within a few years and once many folks know this they begin to shy away from Ikea and the like. Antiques with their durable qualities look ideal in comparison. But it takes education and it is hard to compete with the propaganda-like mass marketing of say Restoration Hardware and Pottery barn, etc. If I’m looking for traditional pieces at auctions and estate sales, what should pay to? From my colleague Mari-Jane Williams- a great opportunity! Have a design challenge? If you live in the D.C. area and are looking to refresh a room in your home, send an email to makeover@washpost.com describing your problem. We may use your space in House Calls, for a virtual room makeover, including free advice from a professional designer. I love my antique "brown" furniture and I hate, abhor and loathe mid-century modern (living through it once was more than enough!) Because most furniture and decor is aimed at younger and first time buyers, I have a hard time locating sources of traditional fabrics, wallpapers, lighting, etc. Can you recommend some sources for those of us who are not 1 percenters? Thanks. It is hard to find traditional fabrics and other related decoration. The secondary market is the best source- etsy, eBay, vintage stores and if you hire a decorator there is more to the trade, but we are always searching to find things that are fresh and fit into a traditional setting. We were living in a Baltimore City rowhouse during the years when both my children were born. We were on the corner of a busy street where firetrucks (with lights and sirens) went by several times a day. It never bothered my kids, and as toddlers/preschoolers, they would run outside to wave at the firemen when they heard the sirens approaching. How lucky for you to have rowhouse in Baltimore - great city. Go-to for flowers? I know this is seasonal, but do you have a favorite? There isn't a flower I don't admire, even gladiolus appear in my rooms. I think my favorite flowers are Camellias and Dahlias I think because of childhood impression. What is the best advice for dinner party lighting, so everyone looks good but can also see each other ;)! Lighting for dinner parties implies lots of candles and few electric lights in the corners, either in the ceiling or table lamps, form a foundation to light the room--basic coverage. But really nothing beats candle light for the flattery of dinner guests. Love your reference to Edith Wharton on decorating! EW wrote a lot about considering every plane of a room including the ceilings. Today so many rooms have swiss cheese for ceilings with all the terrible can lighting. Can you recommend a way to change a "holey" ceiling and still have sufficient lighting? Thanks. The great news is the can lighting is getting to be much smaller so they are not as distracting, and we are finding we need less lighting in the ceiling The "cottage cheese" coatings on ceiling are really a cheap aberration that should banded to the design junk years. how big or bold can you go with wallpaper in smaller rooms? The patterns can be huge if you handle the details right. It is all about the elements in the room. For a collector we used a big 18th century pattern that is framed in important architecture to good effect (I think the collector's house is on Jaynedesignstudio.com). So don't be afraid of pattern big or small, just think about what goes with it. Thanks to me moving up the mortality chain (my mom passed on a few years ago), I’m at peak family photos and portraits. Mine is a well-documented family, including some old non-photographic portraits. How do you help your clients manage family photos, including for display? We are in the process of scanning or taking pictures of them all. What are some examples of modern elements that you sprinkle in so that your rooms don't feel "too" traditional/all one style? The mural in your New Orleans apartment is an absolute show stopper. Can you give us details? How did you land on this? The mural is based on a book I had as child called The Mississippi. I describe the process on our website- it is a long story much like the river itself. Do you have any places you go to find inspiration for projects beyond just the world of interior design publications and social media? Nature, Museums, and Travel are essential to the greatest designers. Magazines can really only provide glimpses to great design One needs to go out and see it. Love that brown furniture! Great chatting with Thomas Jayne and you lovers of history and beautiful craftsmanship. Thank you so much Thomas. Next week I'll be chatting with designer Nicole Gibbons of the innovative paint company Clare. Happy spring. I am sorry I am not deft enough to answer all your great questions in an hour. However, many of them are addressed in my books, on our IG feed and in our newsletter. The brilliant thing is that we are asking questions. And when we look to traditional design with can find a millennium of answers. We are all comrades in the great design traditions. I so appreciate spending time with your all, and thank you Jura.